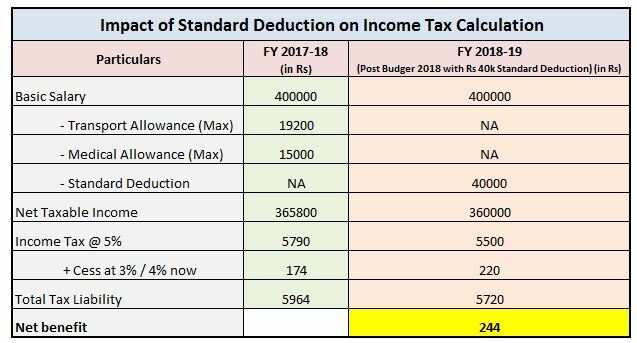 Is Rs 40000 Standard Deduction from FY 2018-19 really beneficial? You are here: Home / Tax Planning / Rs 40,000 Standard Deduction from FY 2018-19 | Does it really benefit the Salaried? In the Union Budget 2018-19, the Finance Minister has proposed to provide Rs 40000 Standard Deduction from salary income to all employees & pensioners. A Salaried individual can claim annual Transport allowance (conveyance allowance) of up to Rs 19,200 (Rs 1,600 pm) and up to Rs 38,400 (Rs 3,200 pm) by differently-abled persons. The Salaried can also claim up to Rs 15,000 (Rs 1,250 pm) medical reimbursement. To claim this, you would have been submitting medical bills to your employer and getting the allowance benefit. These allowances are part of Section 10 of the Income Tax Act. With effective from FY 2018-19, a standard deduction of Rs 40,000 in lieu of travel and medical allowances has been proposed for salaried employees and pensioners. However, the transport allowance at enhanced rate (i.e., Rs 3,200 pm) shall continue to be available to differently-abled persons. Also, other medical reimbursement benefits in case of hospitalization etc., for all employees shall continue. What is Standard Deduction? How to claim Rs 40000 Standard Deduction? A Standard Deduction is nothing but a fixed amount of deduction. There are two types of Standard deductions that are now allowed in FY 2018-19 / AY 2019-20. An amount of Rs 40,000 which can be reduced by taxpayers receiving salary or pension income, from their gross salary. A similar provision of Standard Deduction from Salary Income was earlier available but was abolished in the Finance Act 2005 (new provision as per Budget 2018-19). Standard Deduction @ 30% can be reduced from ‘Income from Rent receivables’ under the head ‘Income from House property‘ (existing provision). How to claim a standard deduction of Rs 40k? To claim this standard deduction, there is no need to submit any bills to your employer(s) or the IT department. As per this new provision, irrespective of amount of taxable salary the assessee will be entitled to get a deduction of Rs.40,000 or taxable salary, whichever is less. Thus suppose if a person has worked for few days (or) months and his salary was just Rs 40,000 in current financial year, then he/she will be entitled to a deduction equal to salary being the same amount. If his salary is less, say Rs 30,000 the deduction shall be restricted to Rs 30,000. If salary exceeds amount of Rs 40,000, the deduction shall be restricted to Rs 40,000. So, ideally your Form-16 will reflect a fixed deduction of Rs 40,000 in lieu of Conveyance and Medical allowances w.e.f AY 2019-20. How much Tax can be saved with a Standard deduction of Rs 40,000? So, Rs 40000 standard deduction can lower your taxable salary income by a maximum of Rs 5,800. Then, what would be the impact on your tax liability? How much you can save in taxes? The tax saved for each employee on this income would depend on the tax slab that income falls into. Rs 1,740 for those paying 30% tax on this income (Rs 5,800 * 30% = Rs 1,740). In fact, individuals with income above Rs 5 lakh can end up paying more tax after taking into account the standard deduction, the removal of the allowances and the increase in cess rate. The ‘net benefit’ as shown in the above calculation turns negative and the individuals with higher salary income end up paying additional tax due to increase in CESS rate. However, this move can benefit the pensioners substantially, as earlier they did not get any standard deduction or any of the other allowances given to salaried employees. Though the impact of this amendment for the salaried may appear to be minimal, employers, however would stand to gain in terms of being spared of a whole lot of administrative efforts in processing medical bills of its employees. For the entire FY 2018-19, it is up to Rs 40,000. In this case, even if he does take up any new job, the SD would be still be Rs 40,000. Dear sir, if my employer does not show standard deduction of 40k in form 16 can i deduct the same while filing ITR1? Ideally they have to show it in Form 16 for FY 2018-19. Yes, you can take SD benefit while filing your ITR AY 2019-20.
i am a state government servant. AY-2018-19 i did not claim transport allowance/medical allowance in my IT return.And no such type of allowance are add in my income this AY2019-20. my question is can i deduct SD 40k from my gross salary? The maximum that can be claimed as Standard deduction for FY 2018-19 is Rs 40,000 from the Salary income. Dear Pratibha ..Yes, SD is applicable in your case as well..
Dear Sreekanth Reddy, I am Shrikant Bhat. Thanks a lot for publishing informative information! 1. I am working on behalf of a DDO who is responsible for dedn. of tax from the Pay of the employees in his Pay bill register. 2. Older employees are covered by Gen. Provident Fund (GPF) with 6% mandatory subscription – but usually all subscribe at much higher rates to claim 80 C exemptions. 3. GPF accounts are maintained by our PAO & they add interest and after the close of the financial year they send balance sheet to update balances maintained in our records. GPF advances and withdrwals are being processed by us locally and after payment schedules will be submitted to PAO to update in the ledger. 4. Some of the employees are getting interest added to their GPF accounts to the extent of one, two or three lakh rupees annually. 5. Is GPF interest added to their account is taxable? 6. If taxable, is DDO required to add it to salary income or employees themselves can declare & pay tax on it while preparing their own returns. 7. So far we have not considered it for TDS at DDO level. Kindly elucidate. Tuition fee @ Rs. 100- per chiled per month was exempted earlier. Present position may kindly be guided. Some of the employees are claiming it in the form of reimbursement of Children’s Education Allowance (CEA) to the extent of Rs. 50,000 or so. 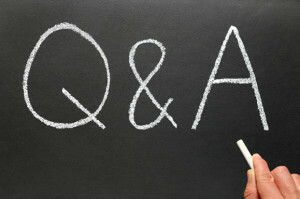 How it is to be treated at DDO level? We are adding Government’s contribution of 10% in respect of new employees to their Salary income. Allowing deduction of 10% under overall cealing of Rs. 1,50,000- and another 10% under 80 CCD. Is it correct? 5 – No, it is tax free income. Tuition Fee paid up to Rs 1.5 lakh can be claimed u/s 80c. Children Education Amount of up to Rs 2250 is provided. For two children Reimbursement can be made up to 49,500/-. Kindly refer to my article regarding 80ccd. I think CEA of Rs. 49,000- is to be added towards income and then for 80 C exemptions. Kindly clarify. 10% Govt.Contribution for NPS of the employee – is it be added for salary income? We are adding it. Then giving exemption under 80C as well under 80 CCD. Is it correct? Yes, CEA is an allowance so it can be claimed as a reimbursement from Gross income and Tuition fee of up to Rs 1.5 lakh is a Tax deduction u/s 80c, both are different.. Employee contribution to Pension scheme of up to Rs 1.5 lakh can be claimed u/s 80 CCD(1). This deduction is under the overall Rs 1.5 lakh limit under Section 80C. Second, up to 10% of the basic salary put into the NPS by the company (employer/govt) on behalf of the employee is deductible without any limit u/s 80CCD(2). Dear srikhanth sir, how to calculate income tax for partly let out and partly self occupied house in the fy 18-19 ( ay -19-20) . I have already taken home loan from bank and paid interest every month. Does this 40000INR have to be entered by employer in form 16 or can I directly enter in ITR 1 while I file my returns. Please clarify. Thanks. Herald. Your Employer will show the SD in Form-16. Can we add 40000/- under medical expenses while filing ITR or do it deduct it from the gross salary. Appreciate your quick response. The SD is deducted from the Gross Salary. Thank you dear Ajay.. Keep visiting ReLakhs.com ! IF EMPLOYEE WAS LEFT DURING THE MID OF THE YEAR THEN HOW WE CAN CALCULATE STANDARD DEDUCTION..?? 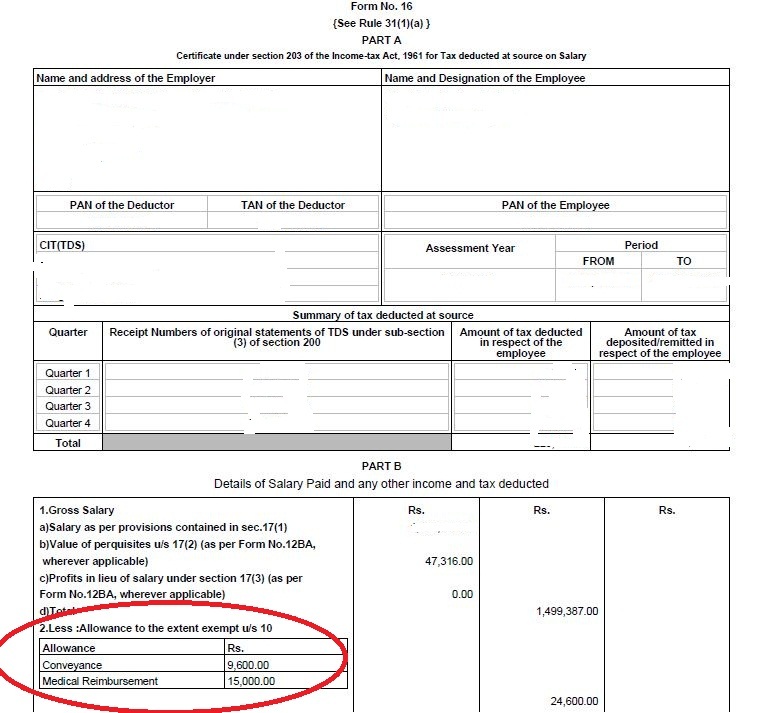 Suppose if a person has worked for few days (or) months and his salary was just Rs 40,000 in current financial year, then he/she will be entitled to a deduction equal to salary being the same amount. If his salary is less, say Rs 30,000 the deduction shall be restricted to Rs 30,000. If salary exceeds amount of Rs 40,000, the Standard deduction shall be restricted to Rs 40,000. Can we get standard deduction of 40000 if the gross salary is more than 500000. Is there any limit of gross salary for claiming. Yes, you can claim SD of Rs 40k. There is no upper limit as such (for gross salary income). is self employed like tuition earners can take the benefit of this 40000 Rs std deduction benefit? No, only the Salaried class/Pensioners can claim Standard deduction from AY 2019-20 onwards..
Hello. I want to know how standard deduction works while calculating tax for the F.Y.2018-19 where Gross income is Rs.1150000/- and deduction u/s 80C is Rs.150000/- Can you elaborate the same? 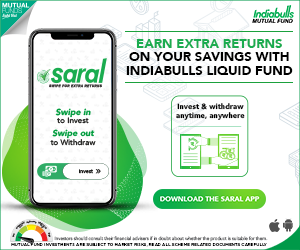 Dear Kvnr ji ..It is not available..
As long as the income falls under the definition of ‘Salary’, standard deduction can be claimed..
Income from FDs falls under the head – ‘income from other sources’..
Gains from shares is ‘Capital Gains’.. I believe this perquisite is still available in FY 2018-19. You may kindly cross-check with a CA. I worked for a public sector Oil company and my pension is paid by LIC Delhi with the amount my company deposited with them. When I file ITR my CA shows the pensions (LIC& RPFO) under head ‘salary’. Will I get standard deduction of Rs.40000/-? I believe that you can claim Standard Deduction. Kindly go through the points given in the above article. Annuity income and pension income falls under the head ‘income from salary’. However, family pension falls under the head ‘income from other sources’. Is the Varishta Pension Plan, started after 60, also covered for standard deduction in FY 2018-19? As per the latest clarification by the CBDT, Standard deduction is allowed on pension from former employer. Keep up the great work dedicated to people. Nice article Srikanth. For salaried employees, form-16 should reflect this 40K deduction, hence no specific deductions to be claimed while filing income tax returns. can pensioners and other persons without salarly but income form other sources filing itr 1 get this deduction or is it only for salaried people? It is for the salaried and pensioners only..